National Jeweler reports that Watch retail giant Tourneau has announced Wednesday that it has agreed to be acquired by an investor group led by Green Equity Investors IV for more than $300 million. The group includes members of the Wexler family, which currently owns Tourneau, and members of Tourneau’s senior management team. The transaction is expected to close next month. Current CEO Robert Wexler will now serve as chairman of the board, while Howard Levitt will continue as president and add the new title of CEO. Tourneau’s current senior management team will remain fully intact. Green Equity Investors is an affiliate of Leonard Green & Partners, a Los Angeles-based private equity firm specializing in management buy-outs, going-private transactions and recapitalizations of established public and private companies. Managing approximately $3.7 billion of private equity capital, its portfolio companies include several other retail heavyweights: the Neiman Marcus Group, The Sports Authority, FTD Group, Rite Aid Corp. and Leslie’s Poolmart. Meanwhile Tourneau says its recent expansion plans will continue apace. The pending buyout comes at a time of rapid expansion for Tourneau, both domestically and abroad. In the United States, the company recently opened its 33rd retail store at the Pier at Caesars in Atlantic City, N.J. It was the company’s seventh U.S. store opening this year. In April 2006, Tourneau announced its retail partnership with Swatch Group through which it will open watch stores in premium outlet malls across the United States. In addition, Tourneau recently opened two stores in Shanghai through its joint venture with the Peace Mark Group. Tourneau is forecasting net sales in excess of $300 million for the fiscal year ending Jan. 31, 2007. Tourneau is currently #22 on NATIONAL JEWELER’s $100 Million Supersellers list ranking the nation’s largest retailers of fine jewelry based on sales volume. Established in 1900, Tourneau sells new and pre-owned watches retailing more than 100 well-known brands, including Rolex, Patek Philippe, Cartier, Omega, Breitling, TAG Heuer as well as its own Tourneau brand, in more than 8,000 unique styles. 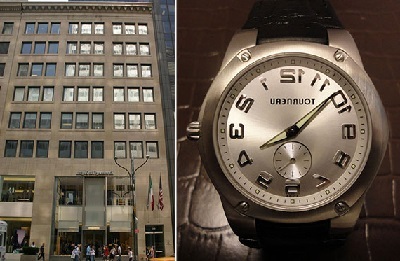 It is recognized by the by the Guinness Book of World Records as the largest watch store in the world. We believe ideas come from everyone, everywhere. At LP Jewelry Designs, everyone within our agency walls is a designer in their own right. And there are a few principles we believe about our design craft. These truths drive us, motivate us, and ultimately help us redefine the power of design. This is just a sample text widget, add your own in Admin -> Widgets.